Oh. .the weather held ..
the hunting was intense. .
the lilac theme made me smile all day. 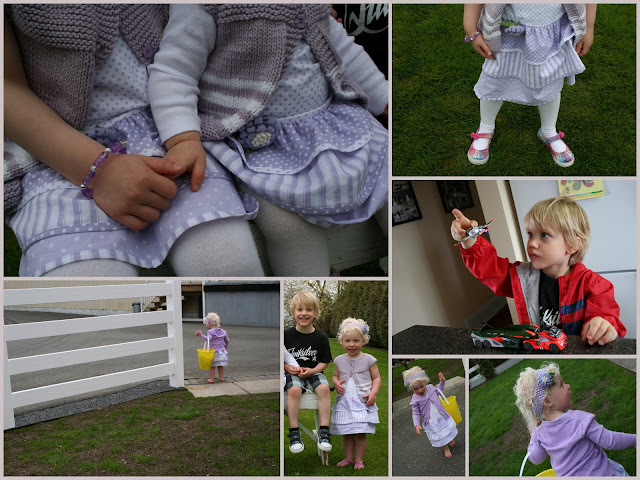 Top left hand picture.. ..Grandgirlie holding her little sisters hand. . Little Miss Muffet. Kanneloni Macaroni with her Easter pail. ..was told their were eggs to be found. ..and heads for the hen house. Lil' farm hand. ..two little girl cousins and one little sister.. . .all smiles. .
Oh. .wow. .dear Heather from Blackberry Rambles. ..
opened up her etsy shop on my behalf to knit me matching little vest sweaters for the grand girls. She sent them off about the same time the little dresses were finished at my end ..
and then we both waited. . When it seemed that Easter would come and go without little vests to keep the girlies warm. .
they arrived in the nick of time. When I opened up the package. .
My eyes fell upon these darling little flowers. Can you believe how perfectly she was able to match the flowers to the fabric? It is an identical match. And. ..one fore me too .. I am seeing the world through lilac lenses right now. .
from the bottom of my heart. .
thank you for sending just the loveliest parcel. We . ..me and the grown girlies and little girlies all loved the sweater vests and felted flowers. I ...did not manage to match the vests to the fabric at my end. .
quite as perfectly as I had hoped. Heather sent some strands of yarn and I purchased fabric to match. .
but it's all good. .
there is more outfits in my imagination . .
and the summer hasn't even yet begun. We had a wonderful Easter Sunday as a family. .
and I trust you did as well. Adorable. I am glad the weather held out long enough. Our boys are adults so there were no egg hunts here. What beautiful little outfits. The looked like Easter treats themselves. So so cute! I'm glad you got a hunt in without a deluge! So sweet! The perfect lilac outifts for Easter...and for the coming months. I just popped over to Heather's to see if she had a link to a pattern...for the vests. Tadah! By the time our kids looked for baskets we had to do it indoors. So much more fun outside, though. The dresses and vests are beautiful!! Loved the pictures! So very sweet....3 matching Easter dresses with knitted vests to match! My grandmother used to sew matching Easter outfits for my two sisters and me...we always loved them! So I know your little girlies do too. How adorable! You are a very organized Grammie - planning ahead and having your plans succeed! I love all your photos!!! I just remembered that my mother once sewed me a lavender easter dress. It had a round yoke and lots of material with lace. When I grew taller she bought really deep lace to sew under the bottom ruffle and extend its life. I loved that dress! My sister had a pink one to match. Delightful! The littles were adorable in their Easter finery! I love the lilac dresses, vests, and flowers - great job! I enjoyed a lovely Easter in the country of the Maple Leaf and enjoyed every moment as well as a multitude of cousins. So sweet! I think the outfits came together so perfectly! Those felt flowers are soooo cute! I'm sure you will have the perfect top to pin it on. These outfits are so adorable! I know you had a very blessed and joyful Easter as the grands make it so much fun! I like the way you think, plan, organize, and are able to see the finished products in your mind. Your grandchildren are so fortunate to have you. The final outfits for the little girls, are perfect!